Levitation is about to enter a new era. This best seller returns with a new floating bill effect on the leading edge of magic. It includes the long-awaited premium Infinity™ IET. Infinity teaches an innovative hook-up that will leave you stunned through its practicality and simplicity. Set-up requires less then a minute and you're ready to plunge into Infinity. • 200 feet of professional IET (over 60 meters). • 100% black matte finish; no stripping required. • Custom dispenser makes IET ready to go. • New, versatile hook-up allows for endless possibilities. • Can be performed in short sleeves, without any jewelry, providing greater mobility; no wax needed! • Excellent for those PK touches. • Includes instructions, plus, a downloadable video with live performances and explanations. 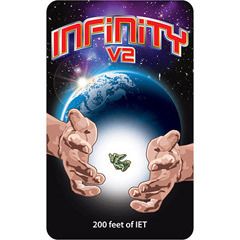 Infinity V2 allows you to take control of gravity itself. It's been talked about in the forums, speculated in private, and sought after by many. Now, it's here. Ask yourself, what's keeping you from infinite impossibilities?